We began with a free association exercise about what could be signified by call America a “Hip Hop nation.” Words like “excess,” “ridiculous,” or “obscene” might come to mind. This is the sort of picture hinted at by the singer, Lorde, in a verse highlighting mainstream images of Hip Hop aesthetics. With this imagery in mind, we might remark that the most Hip Hop moment in American history involved some 18th century colonists who geared up in “wild” costume to protest the Man. 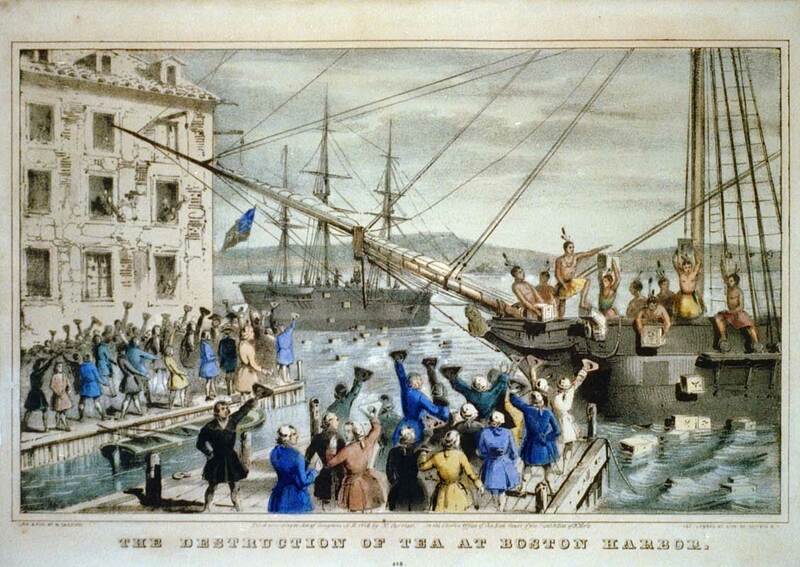 These Bostonian rabble rousers looted the Man’s precious, heavily-taxed tea and made it rain in a local harbor. “Boston Tea Party Currier colored” by Nathaniel Currier, 1846 . Licensed under Public Domain via Wikimedia Commons. Stories like this are part of America’s “best of” album! Is that Hip Hop. When we talk about American as a Hip Hop nation, we might also think of “creativity,” “innovation,” “resourcefulness.” According to Ice-T and Lord Jamar, such ideals are at the root of Hip Hop culture. In the above documentary Something From Nothing: The Art of Rap, Ice-T describes being in the army. He (and a fair number of other blacks) were serving a country that was debating the extent to which people like him could eat, sit, drink, got to school, and otherwise be in this country. And this is in the decades after the Civil Rights Movement. What did black people do in response to such dramatic irony? They did the most American thing possible. They insisted on being heard. They it a straight lick with a crooked stick. The origins of Hip Hop are debated and complex. But it for certain involved echoes of the hip hop of marching, the rhythms of the Post-Civil Rights party scene. And faded into it were the lyric folks traditions recorded by Hurston and others. All of these experiences contributed to the discourse that is Hip Hop. The message has said many things, but it might summarized as #BlackLivesMatter. So with this beat and with this rhyme, what is it that they want Americans to know? Come on everybody and dance to the beat. The concept of a Hip Hop nation encourages us to observe that the American experiment includes moments like these. I encourage you to reflect on them and what they say about America. “The Slaves Who Built the White House,” Talk of the Nation, January 14, 2009. Jay-Z & Kanye West – Made in America (feat. Frank Ocean) from John Deer on Vimeo. The following is a recent sample from the Hip Hop nation. What is it signifying about America? Do the two sayings signify different things? Why or why not?